Dennis M. Haffey has been with Dykema for over 40 years, serving at various times as the Director of the Dykema Litigation Department; on the Executive Committee; as Managing Member in charge of the Bloomfield Hills office; as the Hiring Partner in charge firm-wide of hiring lawyers; and on the Professional Personnel Committee. Mr. Haffey is a Fellow of the American College of Trial Lawyers, and has been named annually for over a decade in both Chambers USA America's Leading Lawyers for Business and Best Lawyers in America, as well as in Michigan Super Lawyers, and other publications. In 2017, he retired from the full-time practice of law, and remains Senior Counsel to the firm, consulting on selected matters, while also teaching and serving as a mediator and facilitator. Shareholder, partner and owner disputes, including minority oppression, fiduciary duty, securities fraud, and disputes arising from mergers and acquisitions. Recovered $20 million after 7 week jury trial on a claim that a Fortune 500 company breached a contract to acquire the plaintiff company. Defended bank against ERISA class action seeking recovery of decline in value of 401(k) accounts from drop in price of employer stock. Represented hospital system in litigation by IRS on whether medical residents were within the “student” exception from social security withholding. Represented a hospital system in litigation raising antitrust, unfair competition, breach of contract and related claims arising from affiliations of and competition between hospital systems. Defended accounting firm against over 500 securities fraud and related claims to recover investments in alleged $250 million ponzi-scheme by the accounting firm’s client. Defended an accounting firm in a multi-party legal and accounting malpractice case, in which plaintiffs claimed excess taxes and other damages exceeding $60 million, because their acquisition of a business used an entity structure that was disadvantageous from a federal income tax standpoint. Obtained a jury verdict for an estate which discovered post-death that decedent’s accounts were “joint” with the decedent’s long-time business manager and sometime girlfriend, who withdrew the funds and closed the accounts immediately following death. Represented the world’s largest owner of advertising agencies in winning a $50 million declaratory judgment in a federal court trial over the lease of an office building. Represented the team owner in claims arising out of the purchase of the Tampa Bay Lightning of the National Hockey League. Represented the team owner in claims involving the Detroit Pistons of the National Basketball Association. Represented one of the nation’s largest owner and operator of venues for concerts and other entertainment. Obtained a five-year injunction and money recovery on an intellectual property claim that trade secret designs were copied and used by a competitor in bids for contracts in China to supply industrial equipment. Obtained dismissal of a $19,200,000 claim against a bank for alleged misuse of Medicare and Medicaid funds, ultimately obtaining court opinions that the Medicare Manual issued by the U.S. Department Of Health And Human Services is not consistent with the federal Medicare statute and does not create a legal duty binding on banks. Successfully represented a mortgage broker against oppression and fiduciary duty claims by a minority shareholder alleging corporate decline due to sub-prime mortgages and collapse of the real estate market. Obtained dismissal of a class action claim against a national distiller and supplier of alcoholic beverages, that marketing was improperly targeted at underage drinkers. Represented minority shareholder in litigation against a national tire distribution company, forcing buyout of minority interest. Obtained dismissal of a claim against a defecting professional hockey player, by the Russian Red Army to enforce an exclusive contract to play in Russia, freeing the player for his professional career in the U.S. Represented the campaign of then-Vice President George Bush in litigation of disputes with the Jack Kemp and Pat Robertson campaigns, over the election of delegates to the Michigan Republican Party convention. The Bush forces prevailed, and President Bush invited Mr. & Mrs. Haffey to the Inaugural Ball, which they attended. Won a multi-million dollar recovery in excess of policy limits in a bad faith insurance coverage case regarding securities claims from the collapse in value of mortgage-backed derivatives. Represented heirs in recovering from trustee/attorney who breached fiduciary duty in using estate assets to supplement his personal art collection. Won a judgment in favor of Korbel Champagne in the trial of a claim by its statewide Michigan distributor alleging wrongful termination under Michigan’s Wine Franchise Act. Won a multi-million dollar jury verdict for minority shareholder claiming oppression and wrongful termination from a sales agency. Mr. Haffey also serves as a mediator and facilitator for civil litigation. Best practices for effective “talent management” in a professional service business where the “talent” is the “product” that the business is selling. Client management, what clients want from providers of legal services, choosing which market segment to serve, and aligning the firm’s talents with client needs. Leadership skills including secrets of success of top leaders, management systems, and a “tool kit” for performing leadership responsibilities. Business basics such as anticipating changes in demand for services, identifying value to be marketed for an intangible product like professional services, cost structure, profitability challenges, and price elasticity. 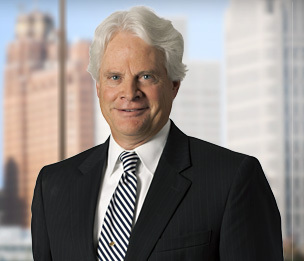 Mr. Haffey served as a “mentor” for younger trial lawyers as part of the Trial Advocacy Mentoring Programs presented by the Detroit Federal Association for several years. In 2015, he was one of the trial lawyers requested by the chief judge of the U.S. Bankruptcy Court in Detroit to present a mock trial as a practice program for younger lawyers. In 2018, he taught at the University of Michigan Law School at a presentation on Professionalism, and has been asked to make a presentation at a seminar on Business Development for Associates. He also served as a mentor for oral arguments at the Law Day Event sponsored by the Detroit Bar Association and the Wayne County Circuit Court.